Note: Second Post of the Day. Please scroll down or Click Here for my Lawnscaping Challenge #7 Card. I sure hope I've inspired some of you guys to play along! 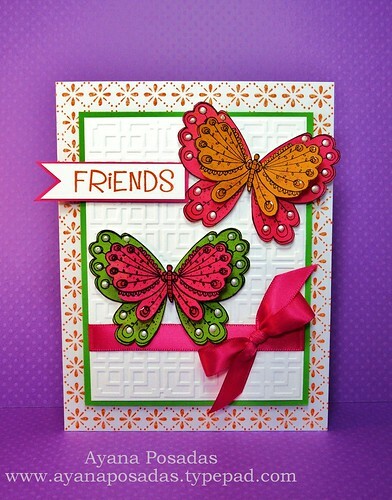 Stop by the DeNami Blog today, for all of the challenge details and for more fun inspiration from the rest of the DT too. 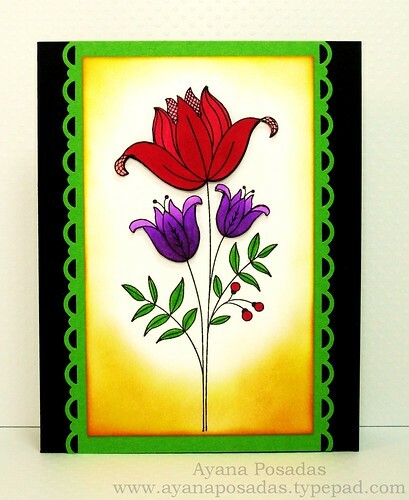 I just have a quick post here today with a card that I made up for the current 2S4Y #52 Sketch Challenge. 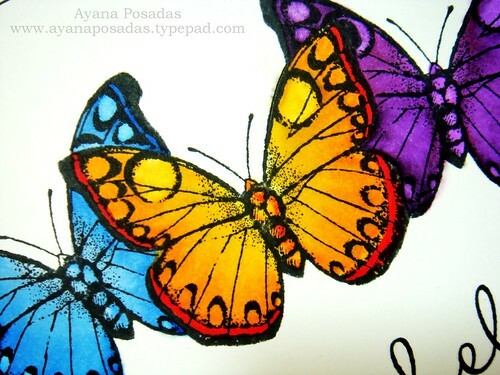 I used the Fancy Butterfly image from DeNami Design, and colored them in with Copic markers. 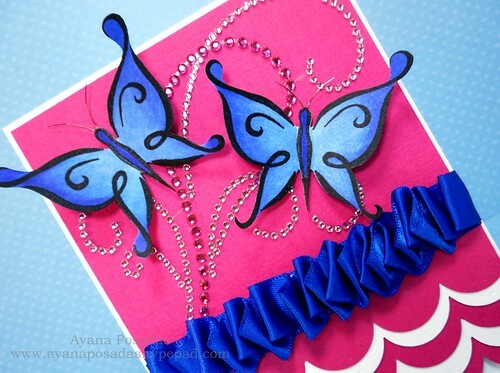 I also incorporated the "Ruffled/Pleated Ribbon Technique" that has been pretty poplular lately in the "crafting world". If you'd like to see some great tutorials for this, you can check out these two videos here and here. Hope you all enjoy this card. I had fun making it. 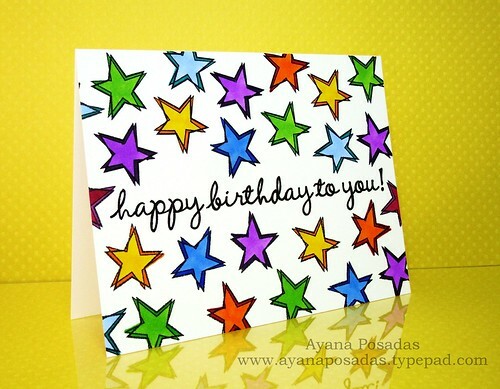 Especially because I used two of my most favorite colors... royal blue and pink! Love it! 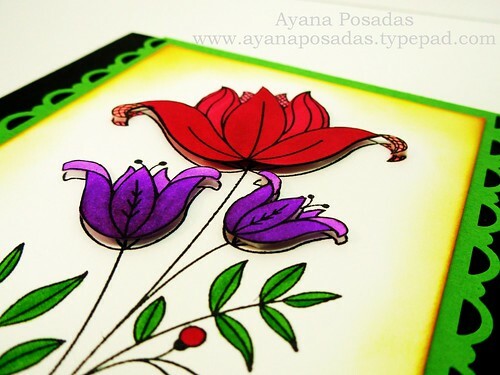 :) I actually ended up making two cards for this particular challenge. So I will probably be making another post later today or tomorrow in order to upload my other card. 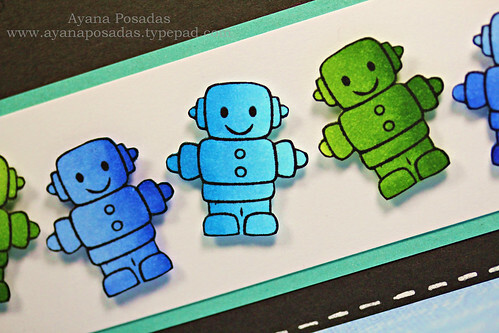 It will be the same sketch, just different colors and stamps. Hope you get a chance to come back later, and check it out! 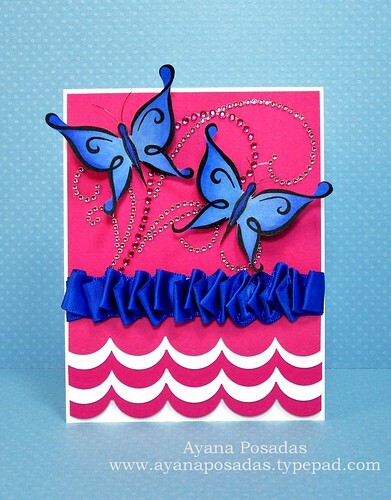 Today I would like to share a card that I created for Kristina Werner's One Layer Card Challenge. 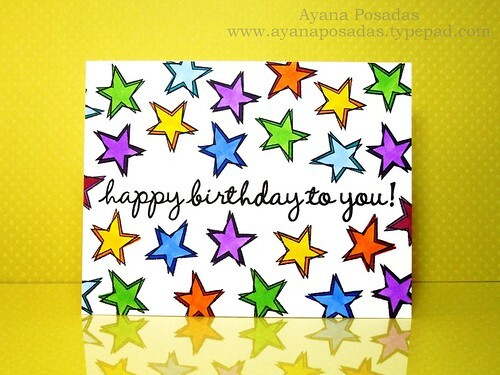 The challenge required us to make a card with only ONE layer... No buttons, no ribbon, no brads, no pop-dots... Nothing!.... hmmm.... Well, I will admit that this is not usually my type of style, being that I always LOVE to add dimension to almost all of my projects. However, I have never done one of Kristina's challenges before, so when I saw that she had posted this one, I was determined to enter, no matter what! 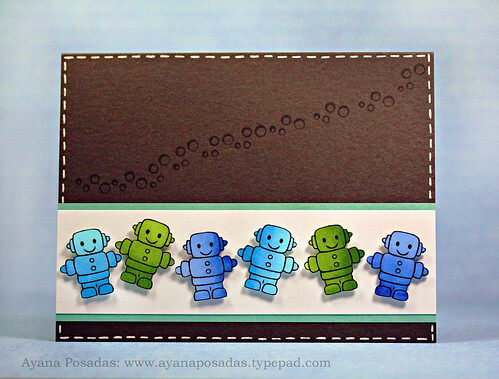 Then, when I was stuck trying to come up with an idea of what to make, I figured it would be a great time to reach for some of my newest products in my craft supply..... My COPICS! =) Haha, I was excited to practice with them, since they are still fairly new to me. 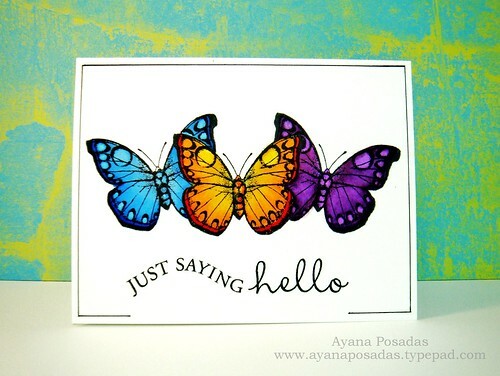 I used one of the butterflies from the Antique Engravings set from Hero Arts. 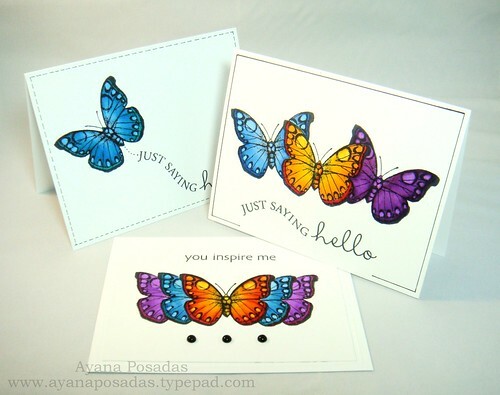 In order to make the butterflies overlap, I made a mask of the stamp by stamping the butterfly on a piece of scratch paper first, and then cutting it out and placing it over the already stamped image, while I stamped over it again. I have to admit... I was surprisingly pleased with the results that I got with this card. So I then decided to make another one. 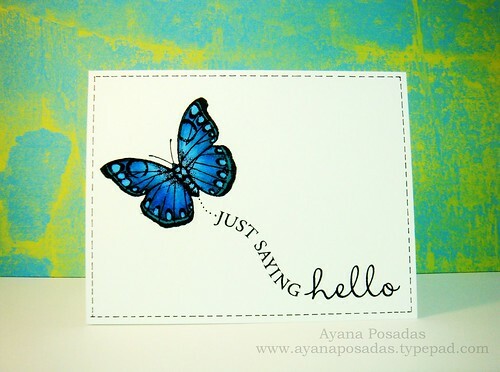 This time I only stamped one butterfly and used this "hello"sentiment from the set: Truly Appreciated by Hero Arts. It's a clear set, so I just love the way you can bend it to form whatever shape you prefer. For this last card, I went a little over-board with the masking technique... haha! 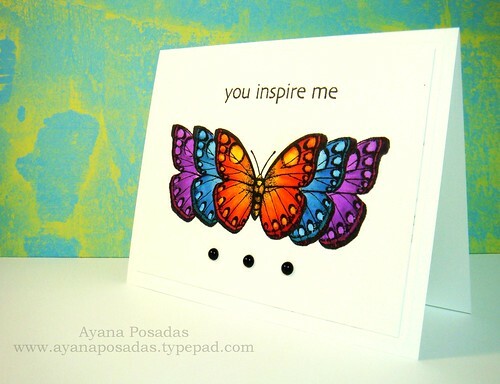 I thought it would be fun to make more wings appear to be coming out from behind the initial butterfly in the middle. Then, even though this was supposed to be a single-layer card, I just couldn't resist adding those three black pearls to the bottom. I thought the card looked a little too plain without them. Well, that's all for my post today. 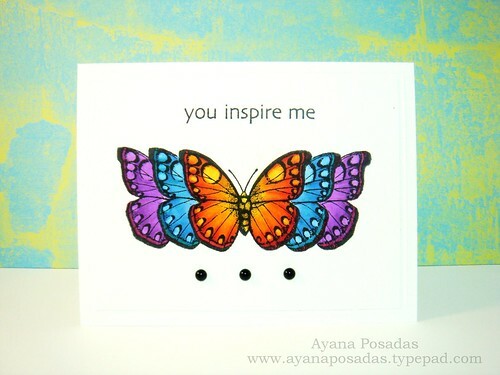 I hope you were able to find at least some inspiration with these cards and using Copic markers. I'm still learning a lot about them myself, but it has definitely become one of my new "addictions" and I hope to produce more projects with them in the months to come.